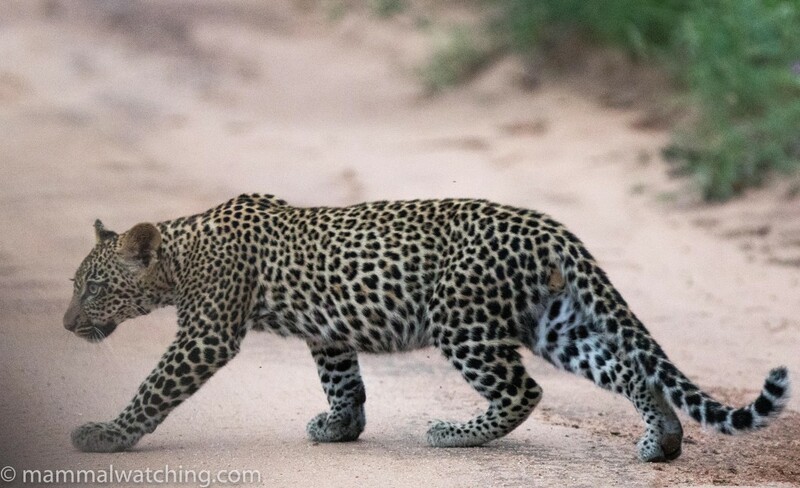 Leopard, Panthera pardus, Sabi Sands. I was back in South Africa over Christmas and New Year 2016/17. This was my fifth trip to the country, but the first time my girlfriend, Amber, had been. Amber has some novel ideas about holidays. 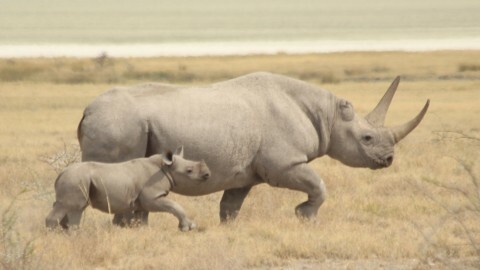 The most radical is that trips do not need to be devoted solely to looking for mammals. She referred to a concept she called “balance”. 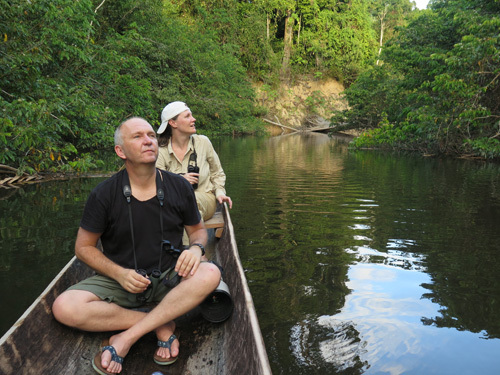 I still don’t fully comprehend balance, but after some intensive mammal trips to Guyana and Ecuador I owed her. And so, and also I must confess because I had already seen just about all of South Africa’s larger mammals, we divided our time pretty much equally between looking for mammals, drinking wine, and gazing breathlessly at some of the world’s best scenery, often while Amber cooked up a wicked braii. It was a fun two weeks. 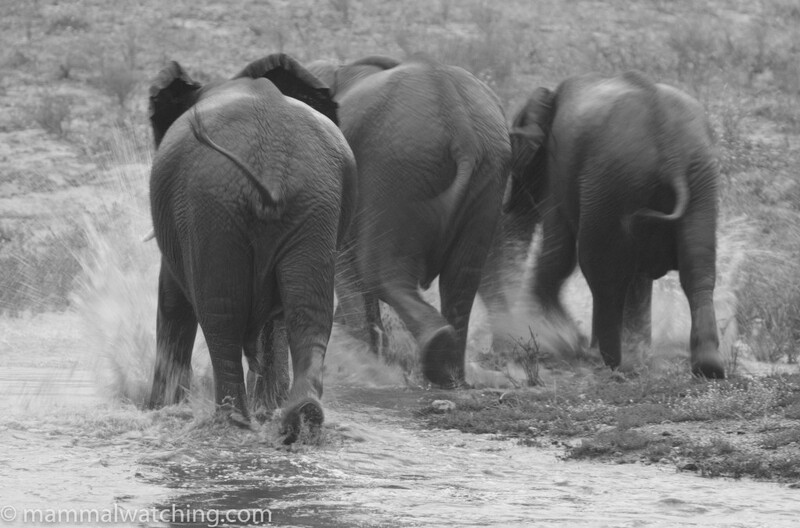 African Elephants, Loxodonta africana, Sabi Sands. I had only two key target mammals on the trip: Riverine Rabbit and Spotted-necked Otter, though I hope to pick up a couple more bats or rats. 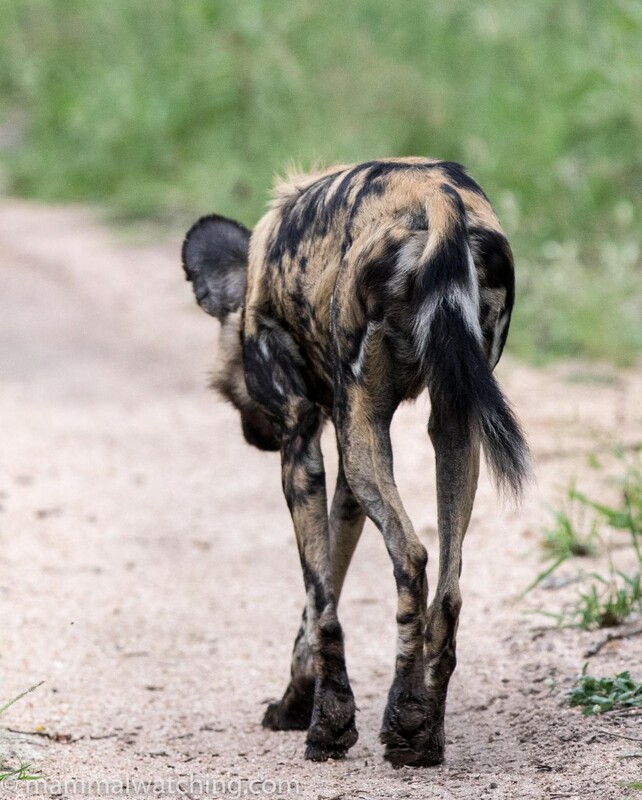 And I spent only four of our 14 nights in places I would have gone for mammals had this been a normal (aka “unbalanced”) holiday: Dunedin Farm, Wakkerstroom and Letaba Rest Camp in the Kruger. 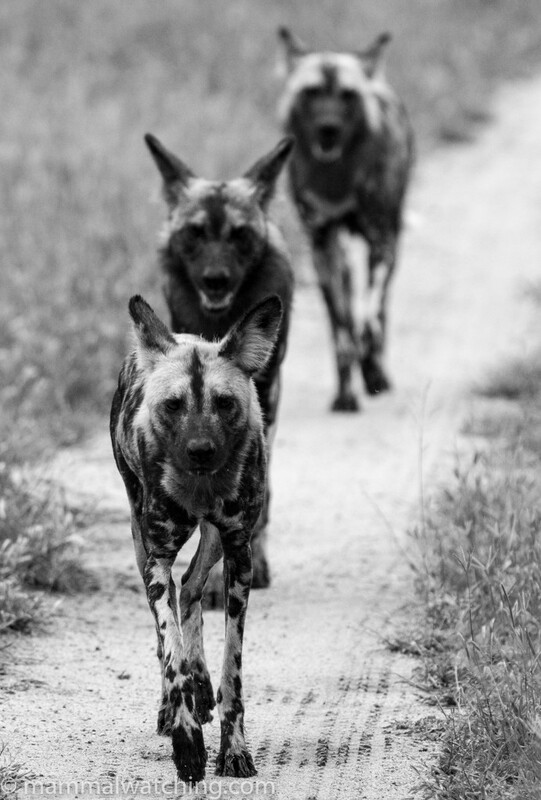 African Wild Dogs, Lycaon pictus. Sabi Sands. 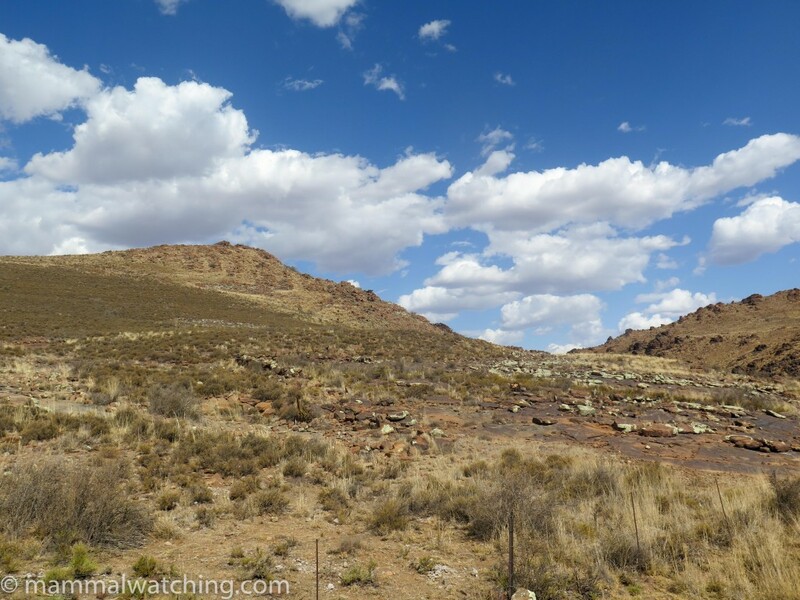 Our route began in Port Elizabeth where we drove into the Karoo for two nights and then back down to the coast and the Garden Route through Storm’s River, George and Hermanus. 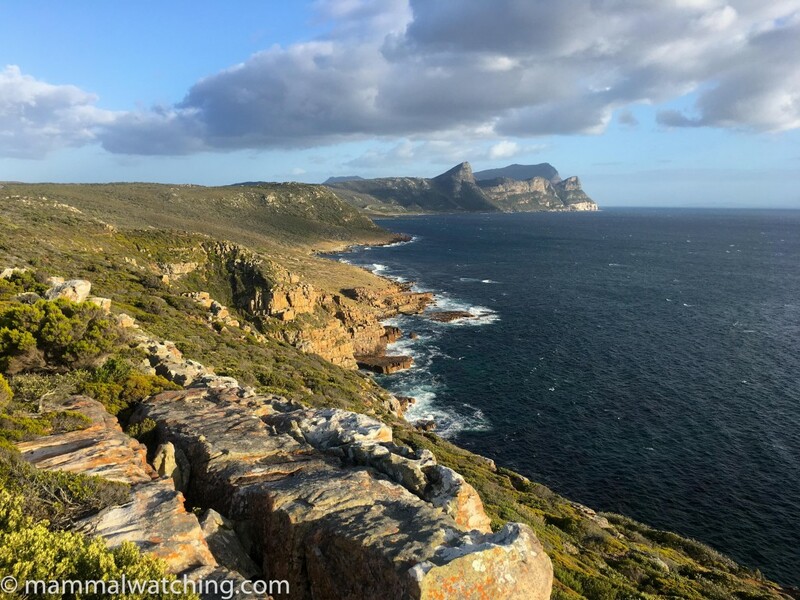 We spent New Years in Cape Town, followed by a couple of days near the Cape of Good Hope. We flew back up to Jo’Burg and drove to Wakkerstroom in the highlands for a night and then to Letaba Rest Camp in the Kruger. 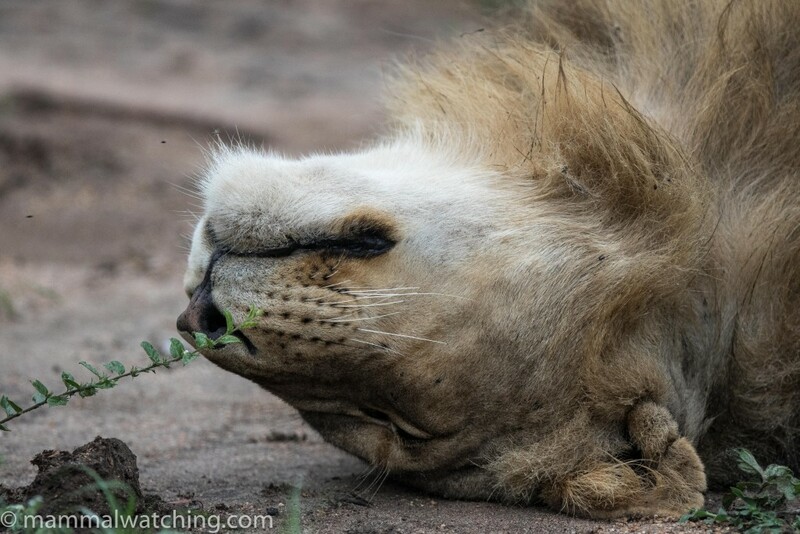 We ended the trip in style with a couple of nights at Sabi Sands. Paul Carter’s glowing report of his visit here in February 2016 inspired me to visit Dunedin Farm. His report is detailed and I won’t repeat it here other than to say it remains accurate. 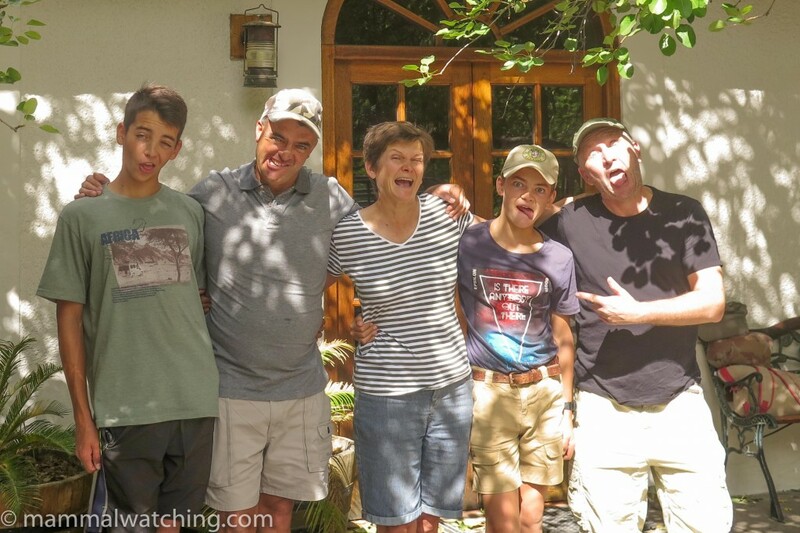 Plus the farm – and Moolman family who run it – are every bit as great as he describes. 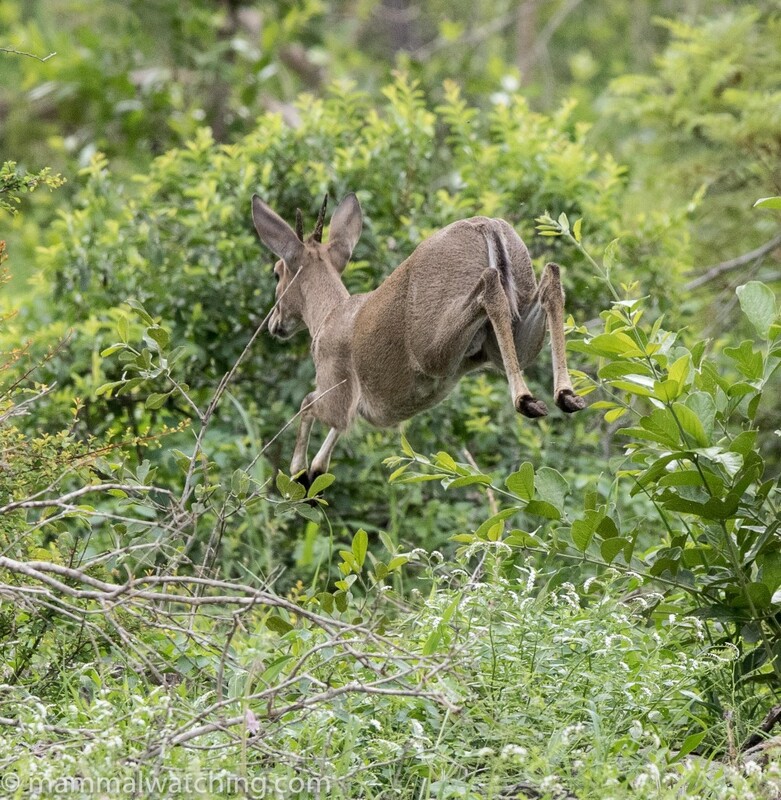 It looks us about five hours to drive there from Port Elizabeth and the only mammals en route were a couple of Cape Grey Mongooses a few kilometres south of Port Elizabeth airport at 9 a.m. and scattered groups of Vervet Monkeys. The Moolmans and me. From the left: Hans Willem, Johan, Marietha, Manus and me. The Moolmans couldn’t do enough to help me find the mammals I was looking for, even loaning me their pick-up truck for our stay after my hire car got two flats in 30 minutes. And though they are all interested in wildlife, I reckon Marietha likes mammals as much as I do. Oh and Hans Willem makes the best cup of coffee on the continent north of Cape Town. Like Paul, and every guest, we stayed in the Riverine Rabbit Retreat: the farm’s self catering guest house about 5 kms from the main farm house. A comfortable and well appointed place, with a lot of space and smack in the middle of nowhere. Riverine Rabbits aside, there is a lot to look for on the farm and my stay here was by far the most intensive mammal watching of the trip. Johan can also show you the best spots to look when you get there. 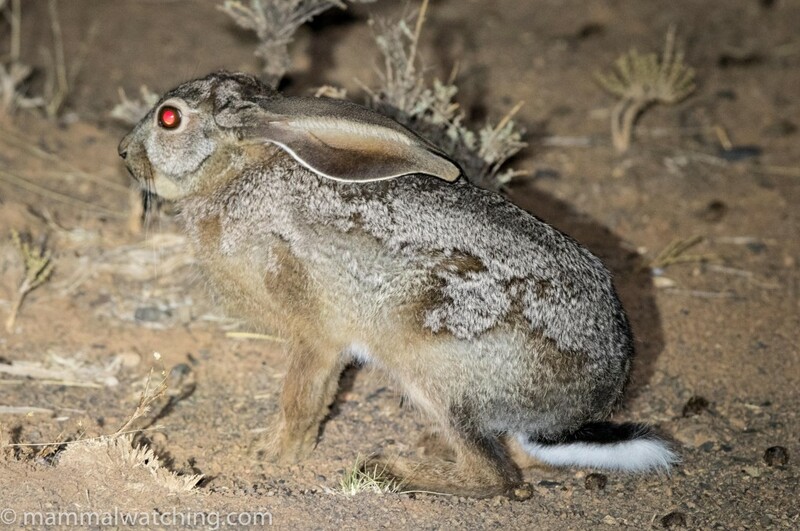 I spent three hours on my first morning from 5 a.m. patrolling a smallish area of the property on either side of the road to the Riverine Rabbit Retreat. I flushed a few Scrub Hares which were a cause for some temporary excitement, but no rabbits. The following morning I looked in the same area at 5 a.m. and then spent an hour looking in another area behind the main farm house: “looking” means walking through thick scrub hoping to flush an animal. No luck. On my way back to the retreat I stopped for a final ten minute walk in the same area I had been patrolling at dawn. 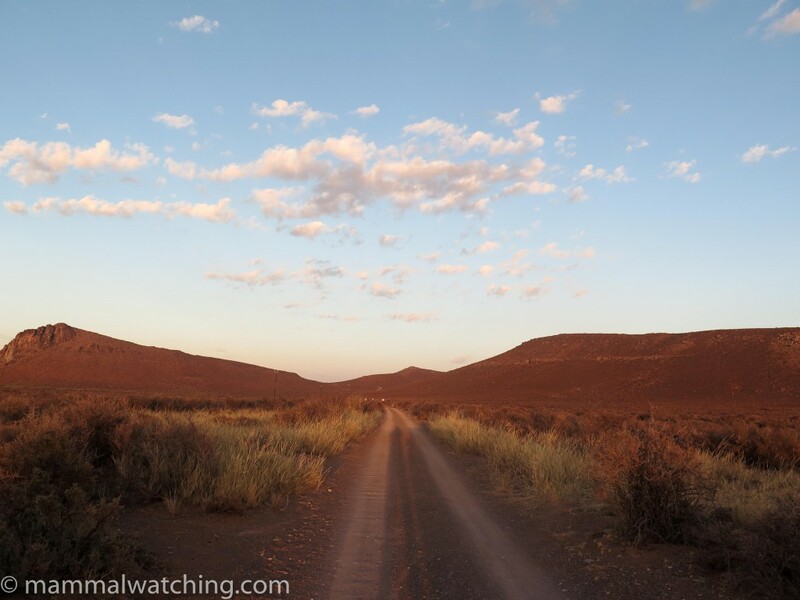 This time walking through the bush along a barely visible 4wd track that leads 300 metres in to a “cattle graveyard”. Walking back to the car – just 20 metres from the road – I flushed a Riverine Rabbit. I had a brief but very clear look at the animal as it lolloped away from me, the tail a dark reddish purple in the morning light. I flushed it again 10 seconds later but then lost it. Phew! Riverine Rabbits are, I realised, very easy to distinguish from Scrub Hares so I had no doubt at all what I was looking at the moment I saw the animal. 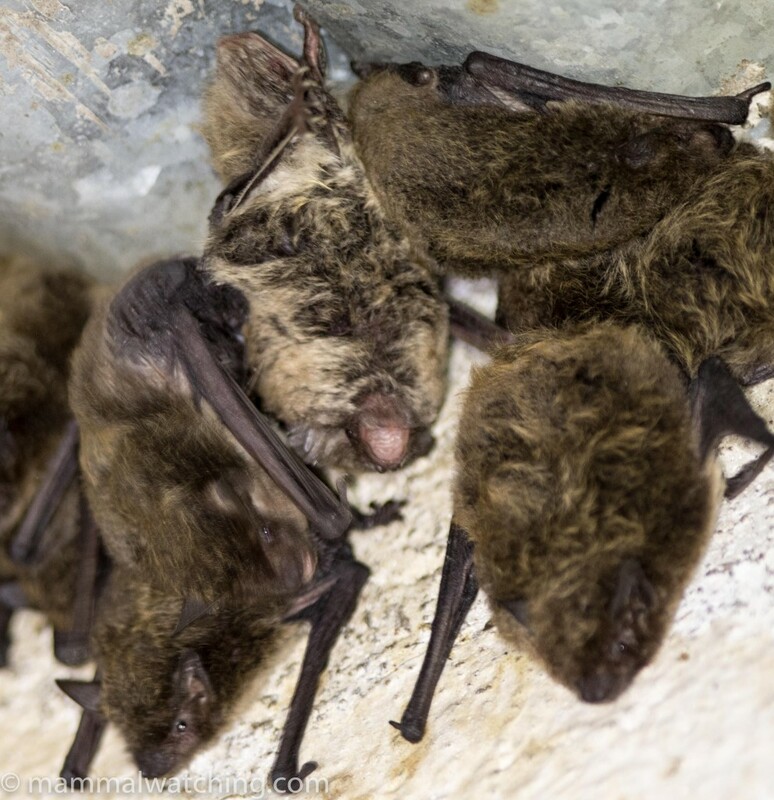 Quite a few species of bats have been recorded on the property and with the Moolman’s help I saw four or five of them. 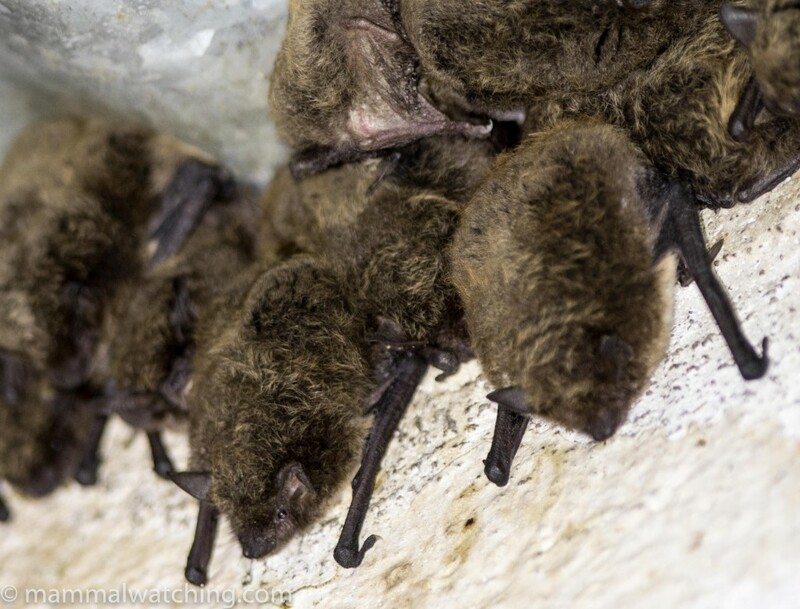 As soon as we arrived Manus showed me some bats roosting in the cracks of the roof above the entrance to a garage behind the farmhouse. These were difficult to photograph and impossible to extract without the aid of barbecue tongs (I didn’t try!). But I saw at least two species here. There were a few free-tailed bats. On the basis of range and a previous study these must be Egyptian Free-tailed Bats, a lifer for me. There was another, smaller and woollier species that I managed to take some bad photos of. At first I thought these were Myotis tricolor which had been recorded on the farm. But when I showed the pictures to Fiona Reid she was certain they weren’t as M. tricolor has distinctive orange tipped fur. 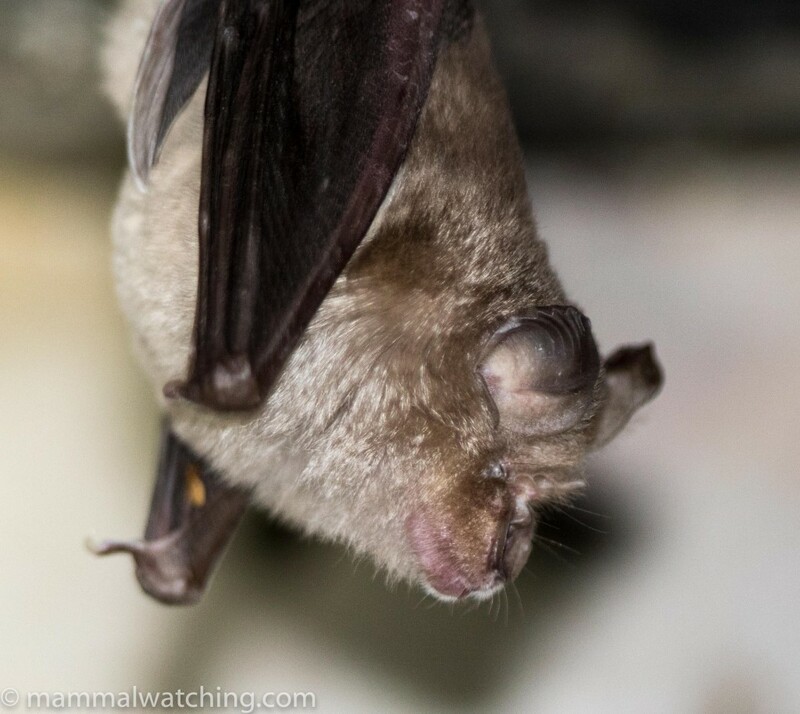 There were not all that many alternatives left, but after flicking through the Bats of Central and Southern Africa I saw a picture of Lesueur’s Hairy Bat which was a ringer for the picture above and had also been recorded on the property. Another lifer. 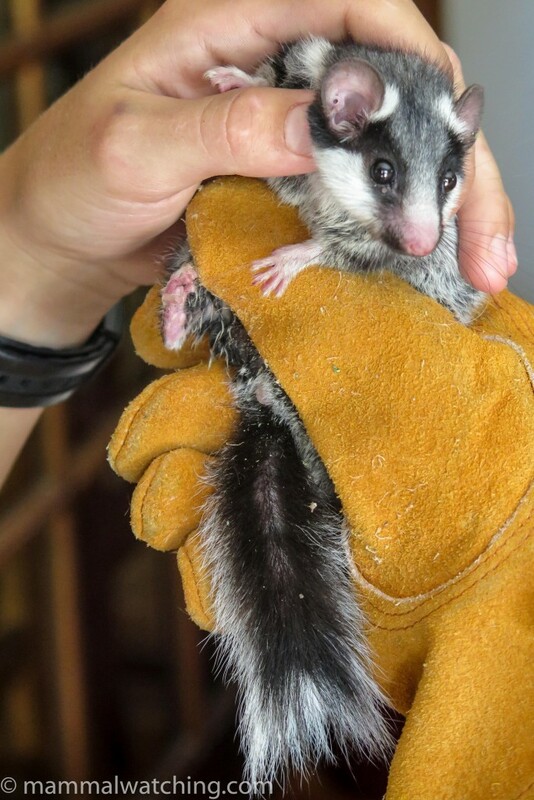 Paul reported a night roost of Long-tailed Serotines in the main barn at the retreat (turn right as you leave the retreat house from the kitchen). They were still using it. 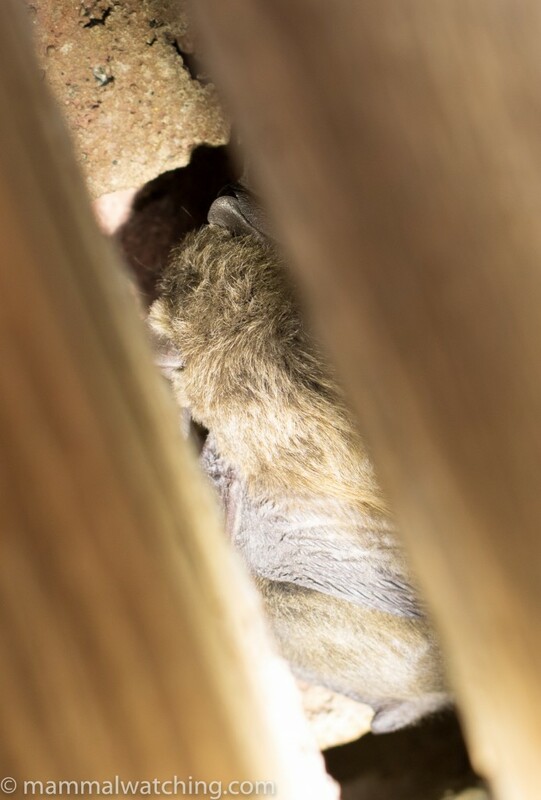 I poked around the other buildings near the retreat and found a lone horseshoe bat roosting in the day. It was in the shed with the blue door (this is the last building as you are leaving the property back towards the farmhouse). Two species of horseshoe bats have been recorded here: Geoffroy’s and Cape Horseshoe. 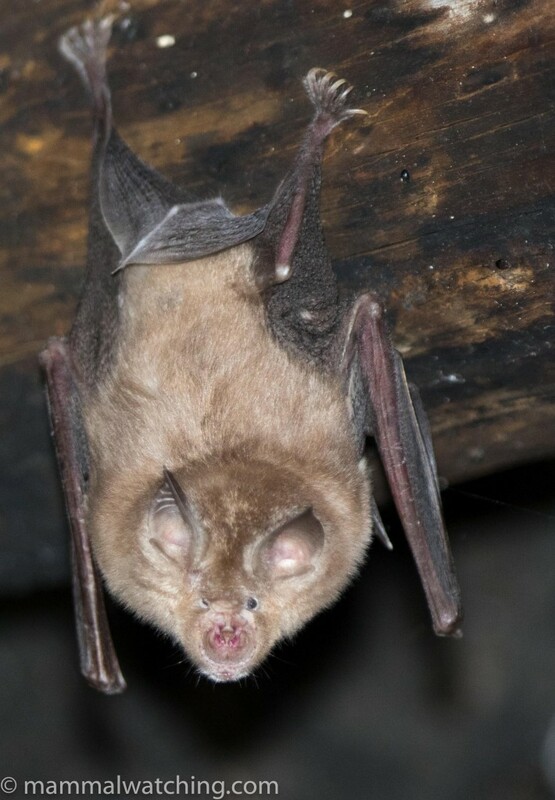 On the basis of fur colour, and that Cape Horseshoes are an obligate cave or mine rooster, I think this must be Geoffroy’s Horseshoe Bat. A bat was using one of the sheds at night. It looked rather browner and might have been a Cape Horseshoe Bat, though it was far too flighty to photograph. 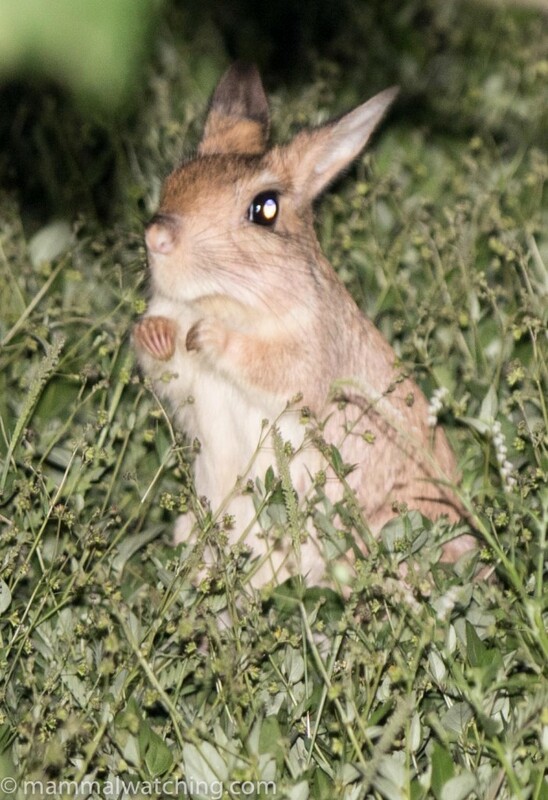 There is a cool list of confirmed and potential species on the farm, including one of the rock elephant shrews and Round-eared Sengis, both of which Paul saw and photographed. 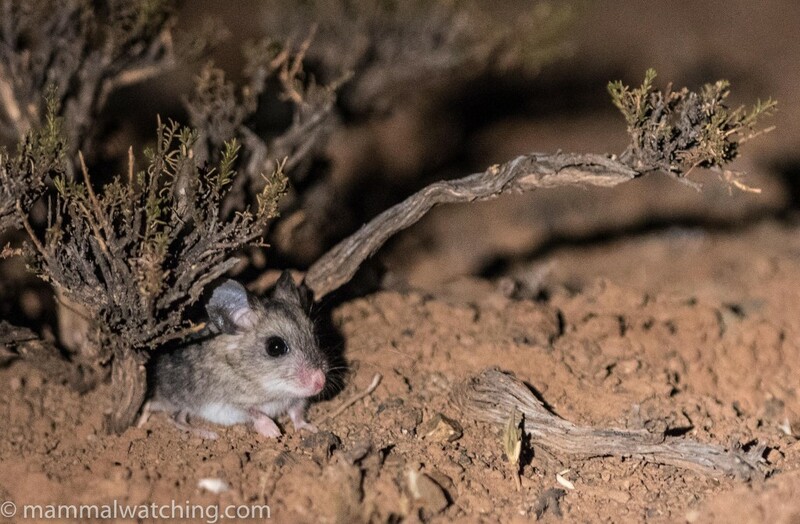 I set traps both nights and, aside from a couple of Namaqua Rock Mice, I hit the jackpot with my one other capture: a spectacular Spectacled Dormouse, the species I was targeting. I got it in traps set among very large boulders just before the pump shed. On a spotlighting drive around the farm we saw two similar smallish rodents a couple of hundred metres apart that I managed to photograph badly. I sent the pictures to Chris and Mathilde Stuart, whose Field Guide to the Mammals of Southern Africa was the first field guide I ever bought, and who happen to live just 50 kms from Dunedin. They were good enough to reply straight away and had no doubt that this was a Cape Short-eared Gerbil. 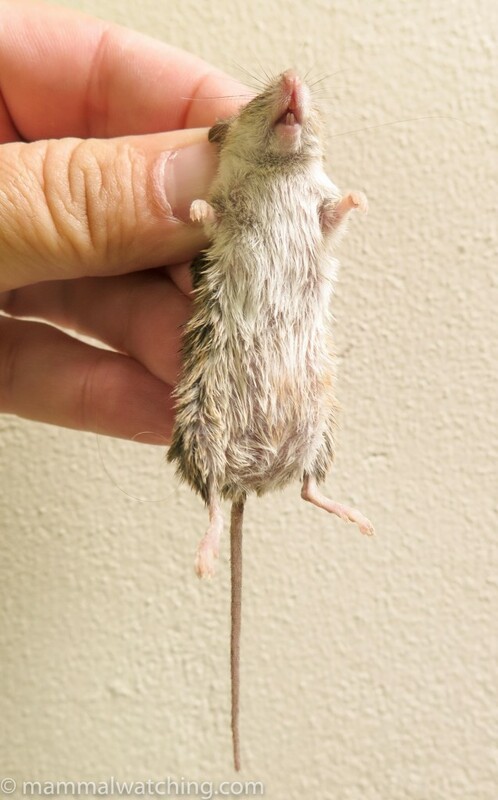 The picture above shows a hairy underfoot which narrows it down to the two local gerbil species, and this wasn’t Gerbillurus paeba, the other alternative. In fact Short-eared Gerbil was my initial guess but I was puzzled that the animal in my pictures didn’t have the obvious white-ear patches that my field guides show. The Stuart’s explained that a small proportion of animals lack the ear patches. Driving back to the retreat from the farm house I spotted a mouse which obligingly posed under a bush. 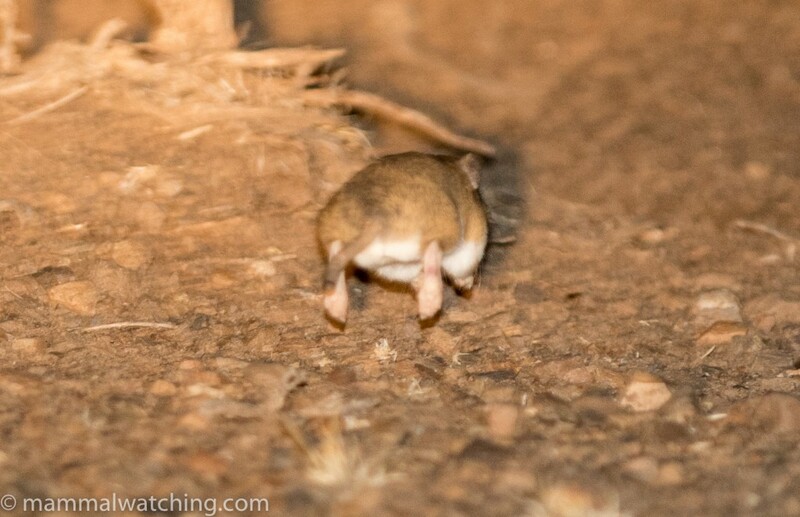 My first decent look at the very groovy Large-eared Mouse, a species I had only glimpsed once before (at Marrick Safari Camp further north) and wanted to see properly. Unlike Paul Carter, I couldn’t find any Round-eared Elephant Shrews near the pump house at night. But I did see a tiny mouse on the track. It disappeared under a bush before I could get a photo but it was much too small to be anything but a Pygmy Mouse. 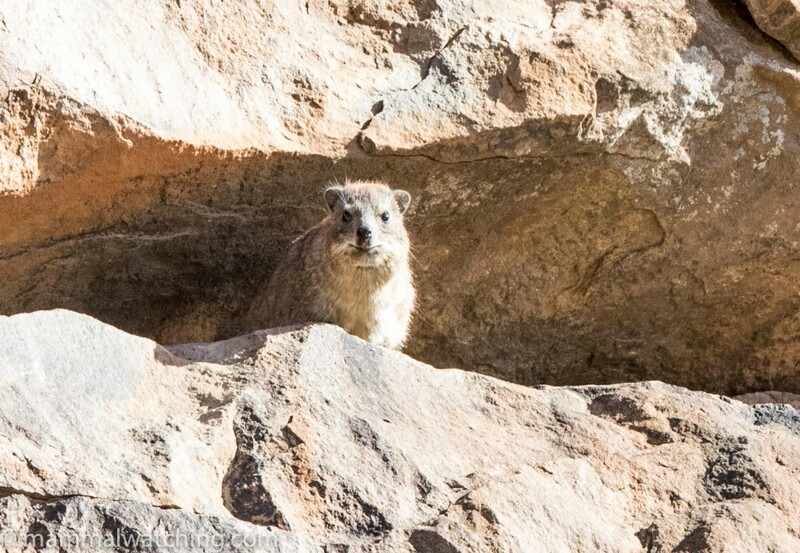 There were plenty of Rock Hyraxes in the rocks above the track to the pump shed, both day and night. 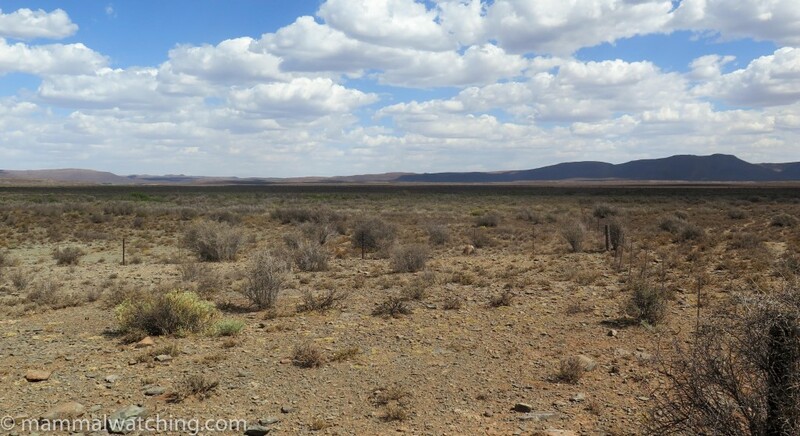 I also saw a Karoo Bush Rat (Otomys unisulcatus) along this track in the day (there is a colony along here near “car crash gully”). I got a better look at one that the Moolman’s cat caught near the farm house. One species I wanted to see, but missed, were the rock elephant shrews. 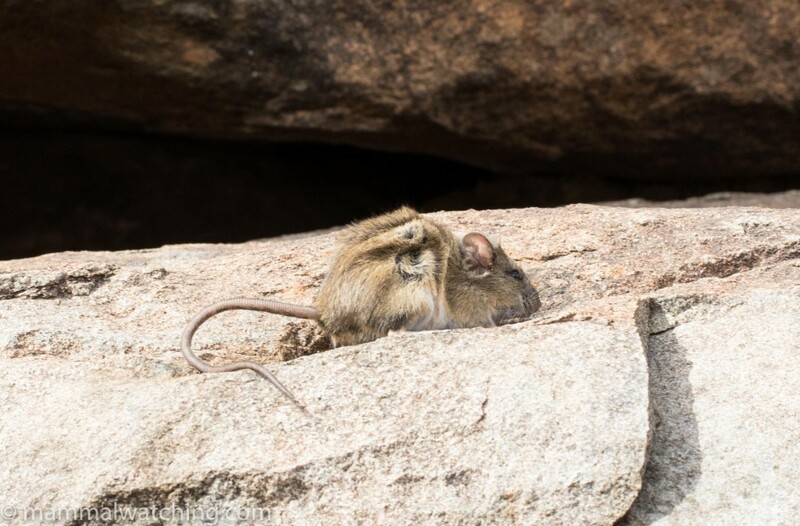 Paul Carter photographed these and tentatively ID’d them as Cape Rock Elephant Shrews (though Western Rock Elephant Shrews are also in range and identical in the field). 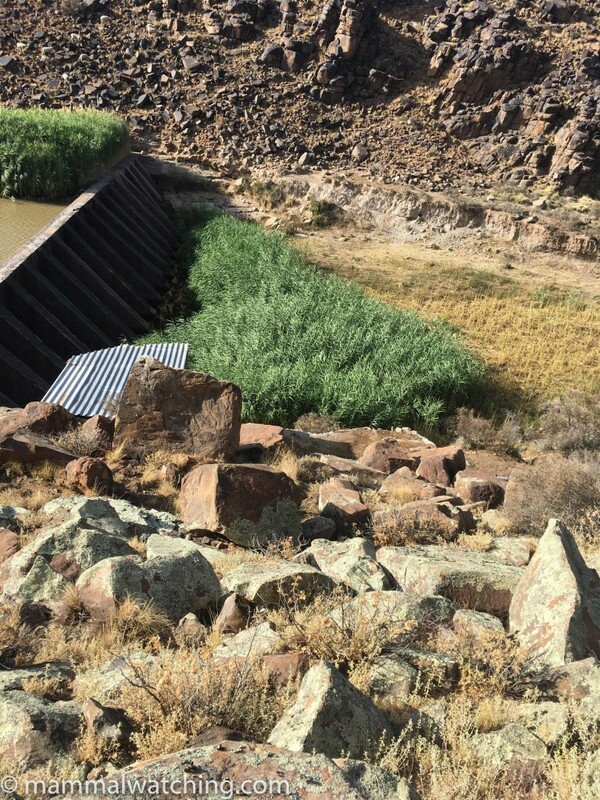 Paul said the sengis were easy to see on the large rocks above the pump house in the late afternoon. I didn’t spend a great deal of time looking, primarily because I was focussing on the rabbit, but during a couple of trips to the right area I missed them. 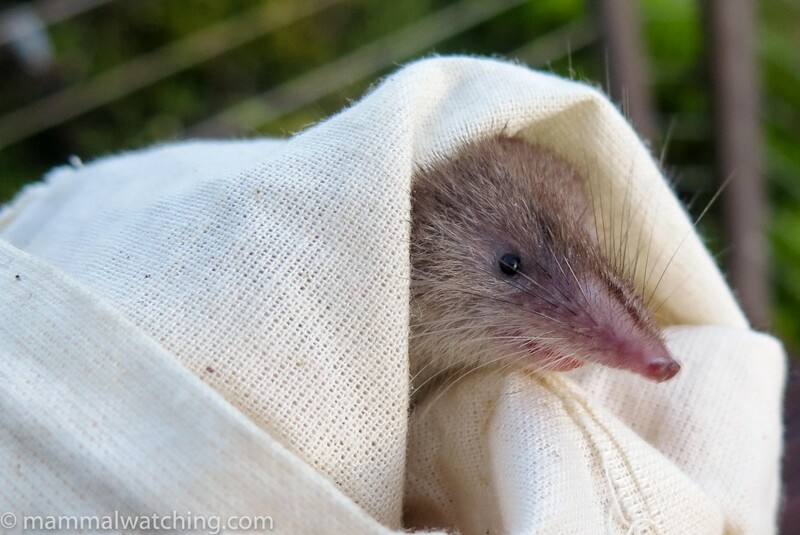 I also went, in the late afternoon, to another location with the Moolmans across the road from their farm house that was good for rock elephant shrews. But we missed them there too: it may have been too windy for them to show themselves. Hewitt’s Red Rock Rabbits live on this hill. As Paul reported, the hill next to the windmill on the way to the retreat is good for Hewitt’s Red Rock Rabbits. Johan said I had to go to the very top of the koppie to see them and so I walked up there after dark. Though I saw a lot of evidence, I didn’t see a rabbit until I got to the very summit. It was then I discovered my camera batteries were flat. Johan and Marietha took Amber and me for a three hour spotlight drive on our first evening. We were looking mainly for Riverine Rabbits. 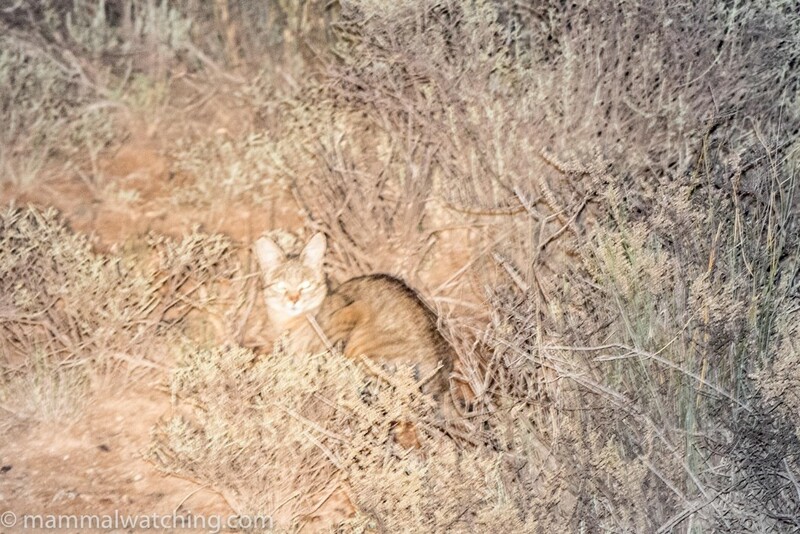 Though we weren’t successful with them we saw several Bat-eared Foxes, many Steenbok and Scrub Hares and I got my first prolonged look at a beautiful Cape Fox. 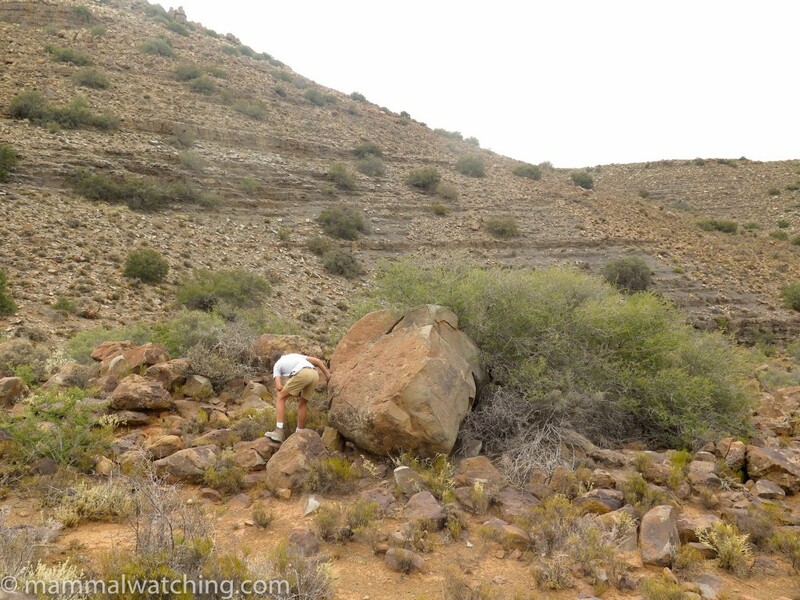 Amber spotted an African Wild Cat, and we saw a very distant animal that was most likely a Small-spotted Genet even though I couldn’t see any spots on it and it looked – from a long way away – more like a yellowish mongoose. We also saw at least two rodent species: Cape Short-eared Gerbils and a Large-eared Mouse (described in more detail above). So Dunedin is a really great place and one I would advise spending three nights, rather than the two I spent there. Mammals aside, the location, the house and the Moolmans alone are worth the trip. You can contact Marietha here. After a few days of enjoying the wine and the views of the Garden Route, and not seeing any mammals at all that I can remember, we spent New Year’s Eve in Cape Town. 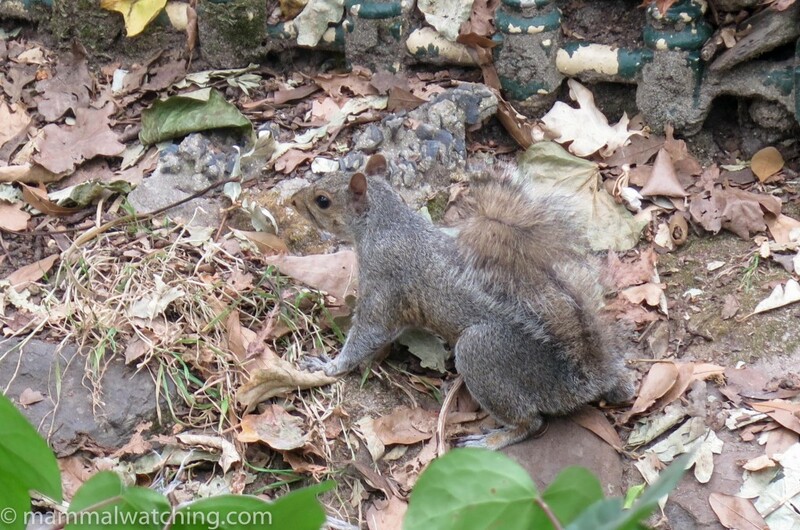 If for some reason you want to see feral North American Eastern Grey Squirrels, then go to Victoria Gardens in the middle of the city. We also spent a couple of nights south of Cape Town in Simon’s Town, close to the Cape of Good Hope, where we stayed at the very nice Avian Leisure apartments. Patrick and Marie-louise, the owners, were nature enthusiasts and were happy for me to set traps in the fynbos in their back yard. They also left food out each evening for the resident Porcupines. We missed the porcupines but they came for the food. Amber spotted what I think was a Cape Grey Mongoose from our balcony. The only animal in my traps was a good one: a Greater Red Musk Shrew (Crocidura flavescens) a lifer for me. It was extremely aggressive. 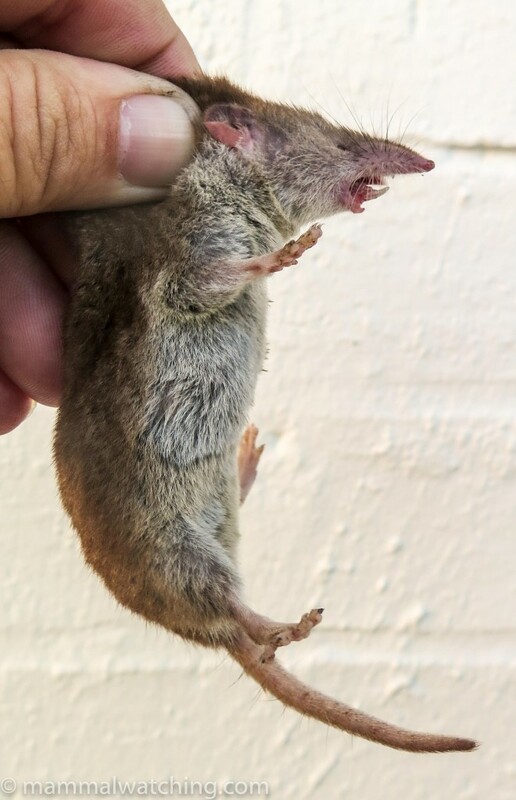 If shrews were the size of dogs they would make Velociraptors seem like puppies. Patrick told me that rock elephant shrews (presumably Cape Rock Elephant Shrews) were quite easy to see on some boulders near Cape Point in the Cape of Good Hope Nature Reserve. I got there before 6.30 a.m and spent an hour looking but couldn’t find any. I am sure the near gale force wind didn’t help so I consoled myself with the fabulous view. 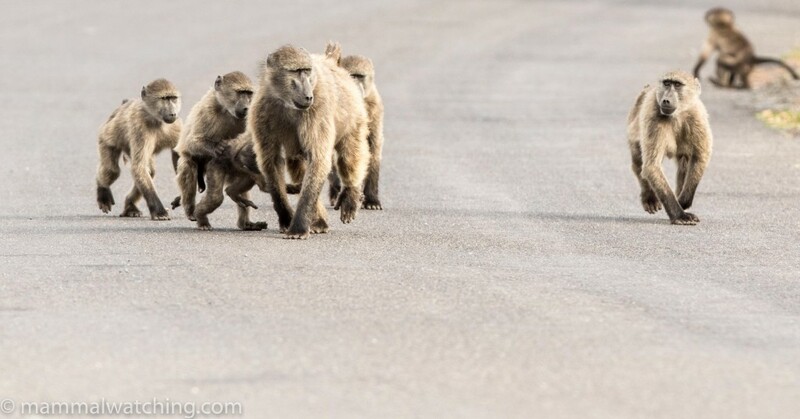 The only mammals I saw in the park were several troops of Chacma Baboons. My other key target for the trip was Spotted-necked Otters. Ironically this is the first species of otter I tried actively to see in the wild, when I lived in Zambia in 1991. I didn’t succeed then. 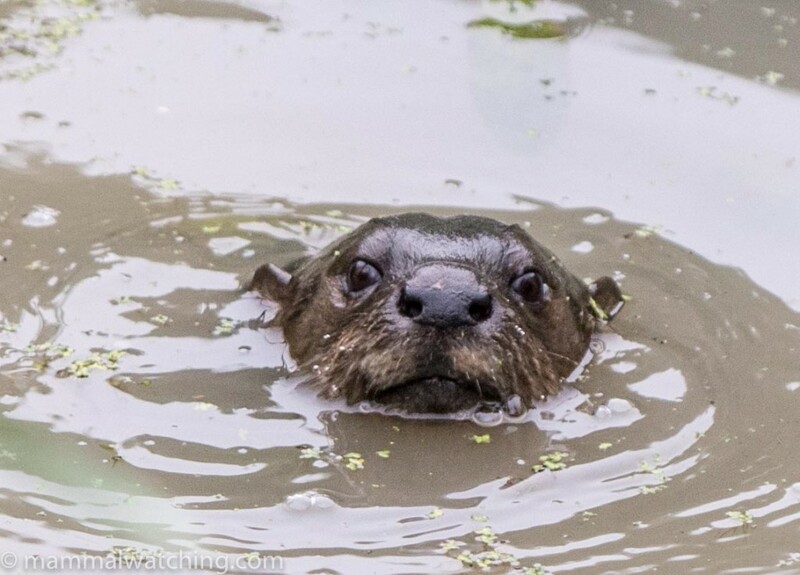 Twenty five years later they were the only otter species I hadn’t seen. I initially thought I would go to Marievale, a wetland near Johannesburg to look for them. Richard Webb saw several here in 2010. But after talking to Leon Marais I decided to try my luck first in Wakkerstroom. Leon, who I got to know when he contributed trip reports to this site, works for Lawson’s Safaris and is a mine of South African information. 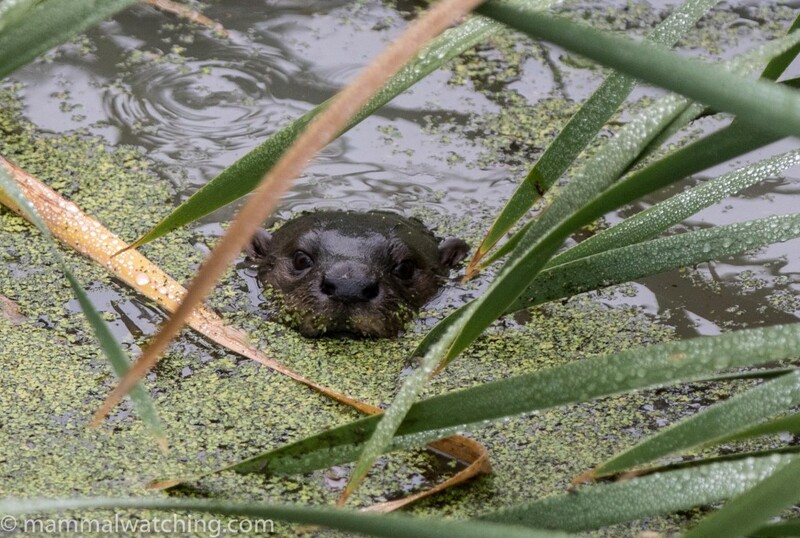 He thought the wetlands in Wakkerstroom offered a good chance of excellent views of otters and might also produce some interesting small mammals too. Wakkerstroom is a tiny community, popular with birders, and the few people in town I spoke to knew about the otters though they disagreed about what species they were. I spent an hour looking for them at dusk to no avail, but was back at 5.30 a.m the following morning. 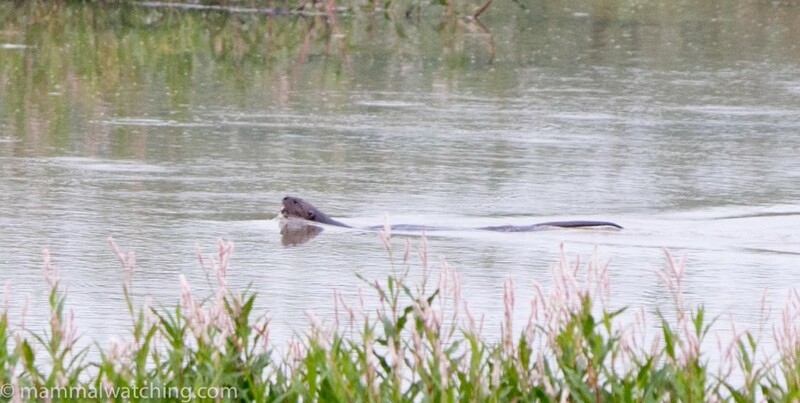 An hour later I saw my first Spotted-necked Otter swimming in the wetlands close to the road. I had another eight sightings over the next hour of between four and eight animals. As Leon had predicted the otters like to swim through a culvert under the road that separates the wetlands from a large dam (lake) so I had stellar views of four animals swimming right below me. The wetlands are just out of town on Slabbert Road heading north. One of the locals was kind enough to meet me at the wetlands to make sure I was looking in the right spot. She said that though the animals might crop up anywhere, the main channel, between the speed bumps after the bridge, is probably the best area to focus on. And that though the otters might be spotted at any time, early mornings were best. She also told me that she has twice seen African Striped Weasels in the area in the past 15 years: the first time in her back yard not long after she had moved in, when she saw a procession of, presumably, a mother and young, moving along her fence line. Very cool. I wouldn’t go so far as to say Wakkerstroom was a hot spot for this species, but I don’t think I had ever met anyone who had actually seen one before…. We stayed at the Forellenof Guest Farm. Great, friendly accommodation, like so many places in South Africa. I saw a Scrub Hare ( I think) and a mouse along their drive going to and from dinner, and set some traps in the long grass on the farm running along a “donga” (a dry eroded stream bed) overnight. The next morning I had caught two rodents, which I assumed would be easy to identify later. I was wrong though I live in hope I can find someone who knows what they are. 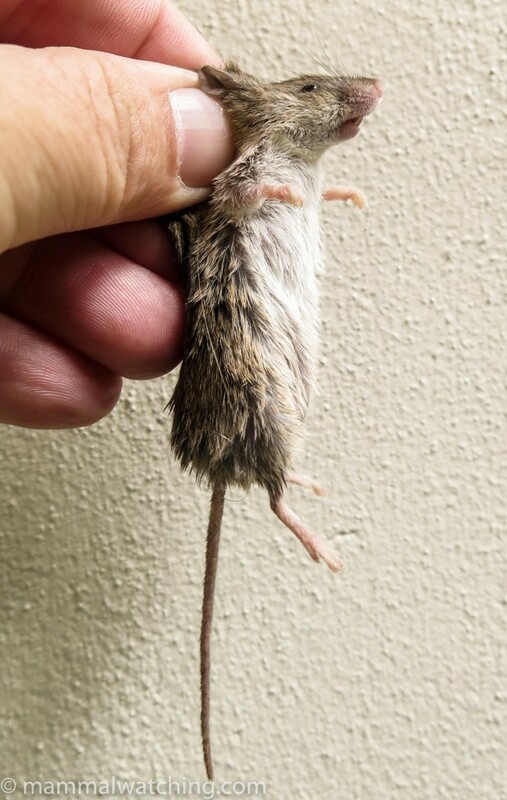 The first was a small mouse, I think a Mus species, with a head body length around 70 mm and a tail about 50 mm long. 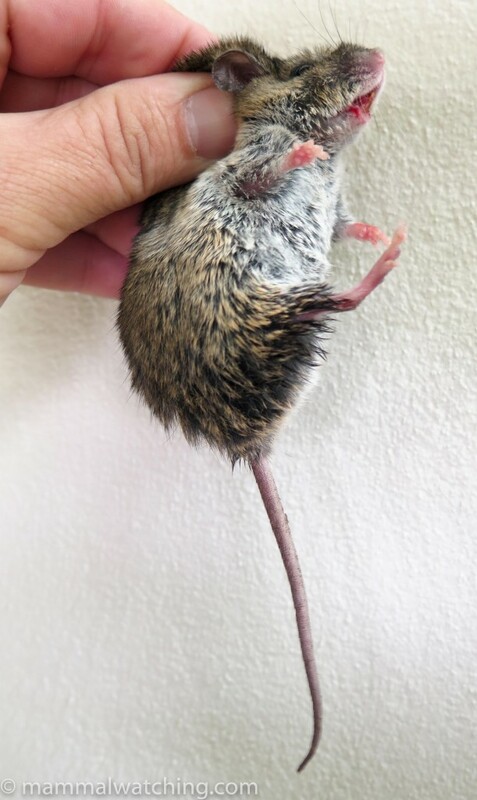 It seems a little large to be a Pygmy Mouse, which was my initial guess. And in fact the Pygmy Mouse species is now a complex with some poorly understood taxonomy. The second species was larger and furrier. It had a head body length of 100 mm and a tail about 75mm. If anyone happens to know what these are I would love to know. 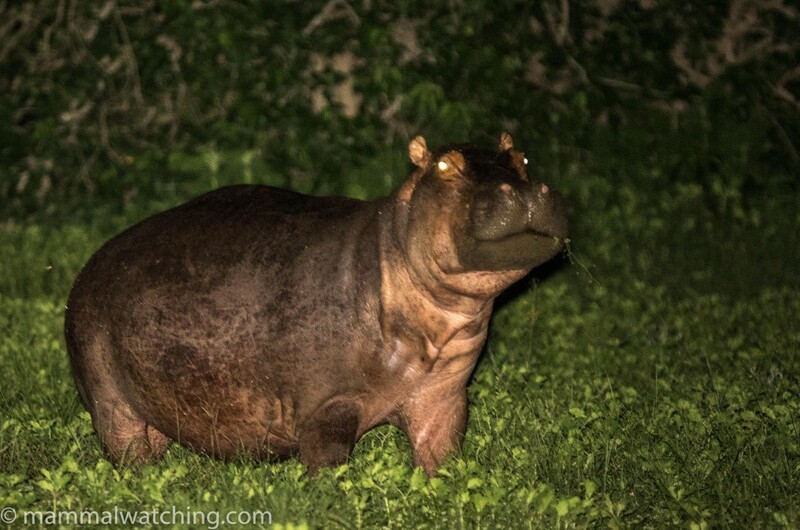 With the otters in the bag we decided not to return to Jo’Burg, via the Marievale Wetlands, and instead drove on to the edge of the Kruger and spent the night in the small town of Barberton. A nice spot but I didn’t see, nor really look for, any mammals. We drove into Kruger the next morning through the Crocodile Bridge gate not long after it opened and spent the seven hours driving slowly north to the Letaba Rest Camp. 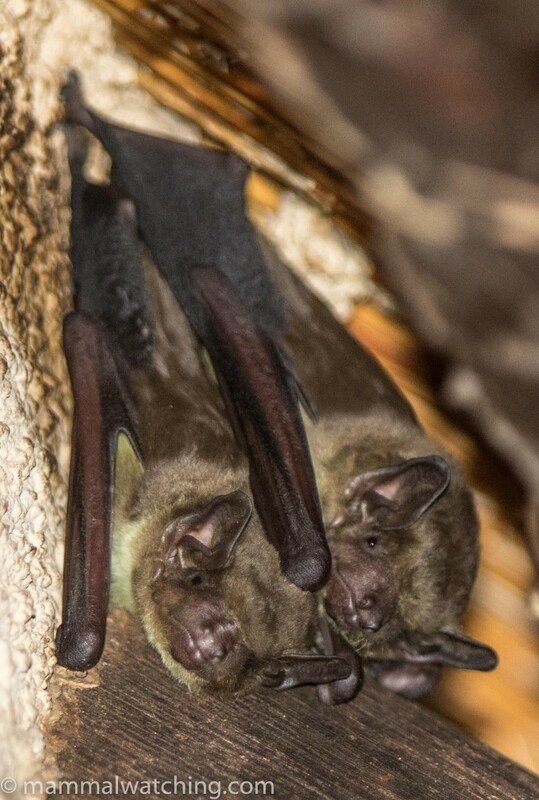 I wanted to visit Letaba to look for bats: it was, according to John Kinghorn’s useful piece on the Bats of the Kruger, the best camp for bats in the park. Romain Boquier saw six species here in 2015. 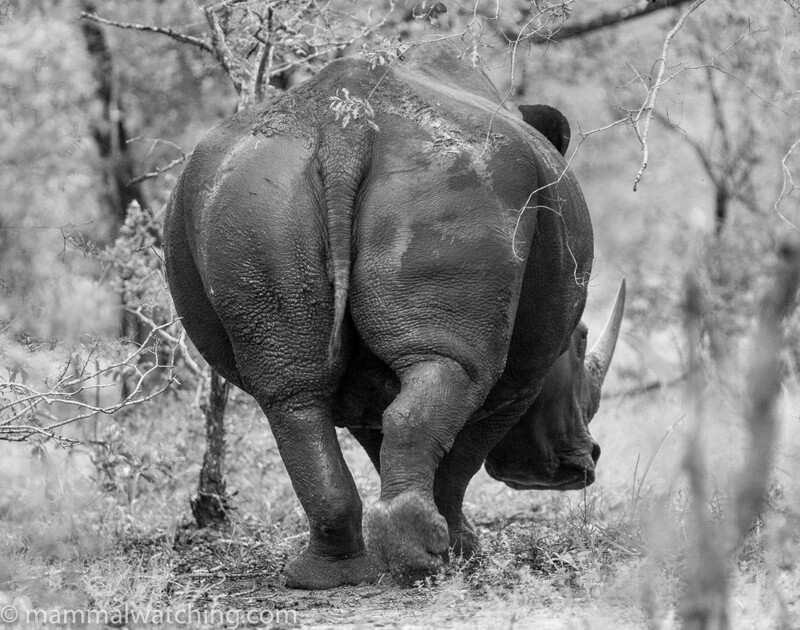 We didn’t see anything particularly unusual on the drive through the park, though two White Rhinos were nice to watch for a while, and I had one of my closest ever views of Klipspringers, when we suprised a pair on the dirt road between Olifants and Letaba after lunch. We stopped in at Olifants Camp for lunch. I wanted also to look for the Darling’s Horseshoe Bats here that John Kinghorn’s article said were living in a guest house. The guest house, though, was a series of private rooms and I didn’t know where the bats were. I left empty handed. 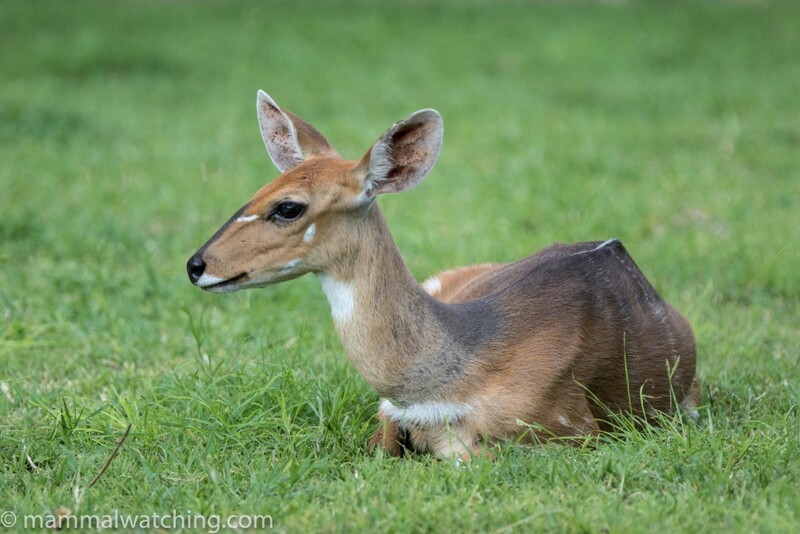 Letaba is a relatively quiet camp, perhaps because it isn’t in the epicentre of Kruger’s best game viewing, but there was a lovely view of a bend in the river and lots of Bushbucks wandering around in the late afternoon when we arrived. 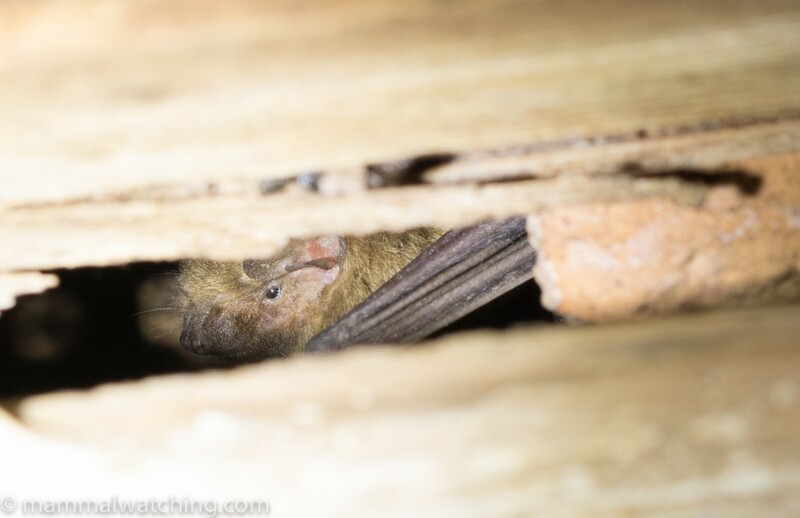 I looked in three or four of the bat boxes scattered around camp and they all still contained large numbers of Angolan Free-tailed Bats, a lifer for me. The next couple of hours were spent checking out the palm trees for roosting Banana Bats. I couldn’t find any, but there were many Mauritian Tomb Bats, some of them banded, roosting high on the trunks. There were more of this species roosting under the eaves of the reception building. I also saw my first African Yellow House Bats here, under the eaves at the back of the reception building. 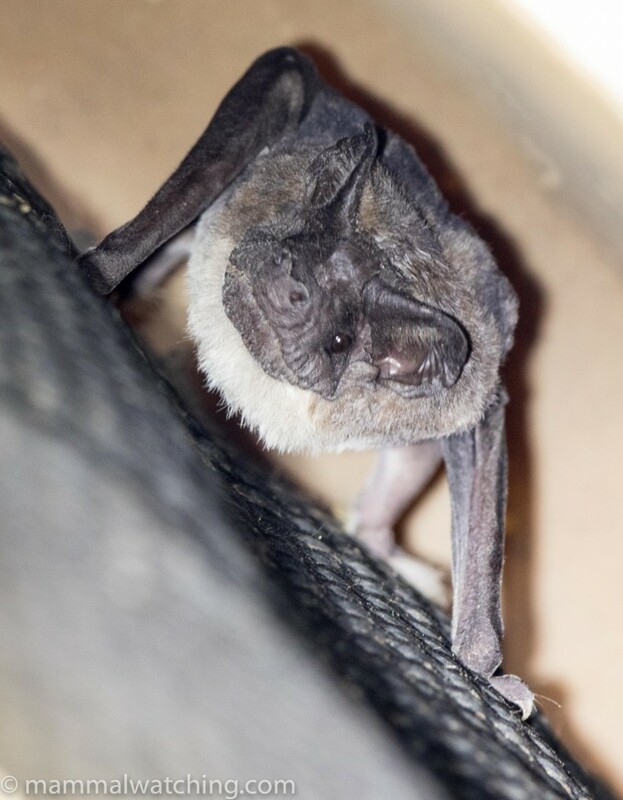 Romain Boquier told me he had found both Banana Bats and Schleiffen’s Twilight Bats roosting under the exterior curtains of the camp’s safari tents. 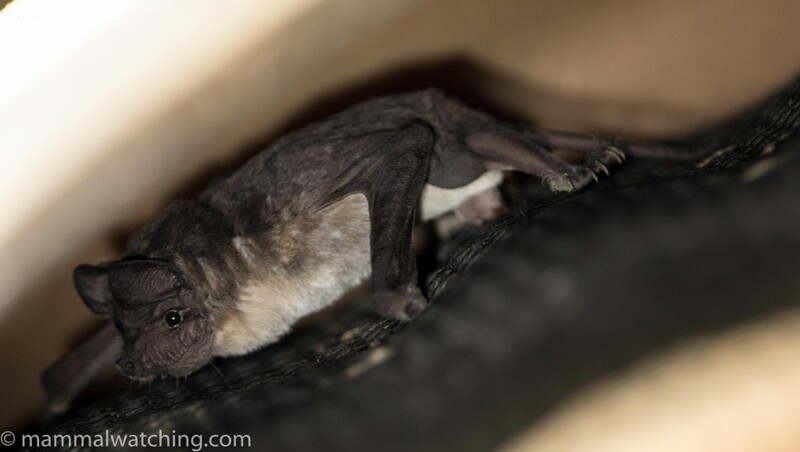 There are ten or so fixed safari tents on raised platforms, and Romain said found bats roosting under the curtains of most of them in March 2015. 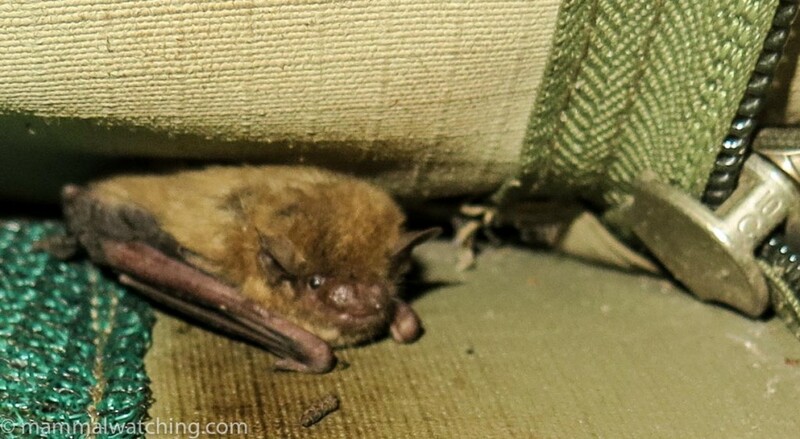 The following morning, once people had checked out, I inspected all the tents and found evidence (poop) in a couple of places but only one bat: a Schleiffen’s Twilight Bat, identifiable by its uni-coloured fur and tiny size, roosting under a rolled up curtain on Tent 1. My third lifer from Letaba. 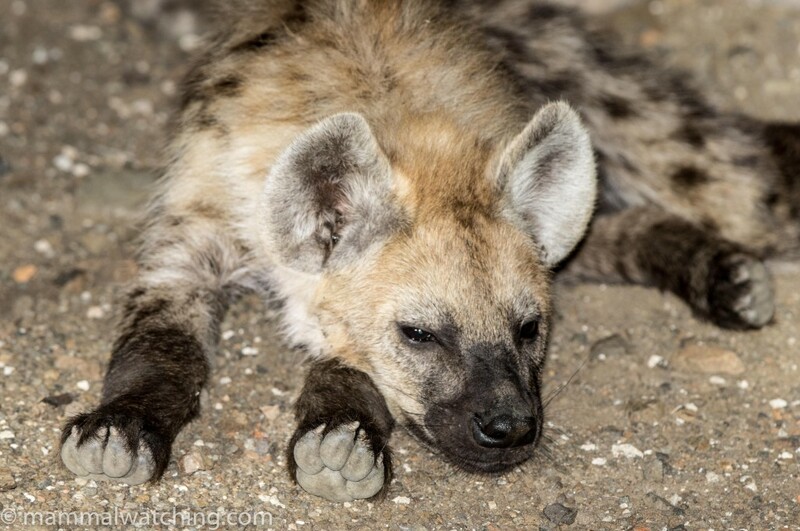 We took an official night drive, which was OK. We spotted a Civet, quite unusual in the area apparently, as well as a few other animals including nice looks at Spotted Hyenas and lots of Springhares. 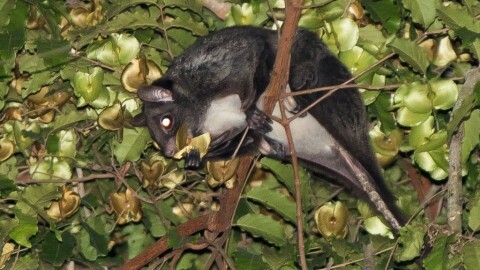 I wandered around camp for an hour at midnight but the only mammal of any note was a Greater Bushbaby in the trees just outside the fence. We ended the trip at Nkorho Lodge in the Sabi Sands reserve, which abuts the southwestern Kruger. Although there was an outside change for a Pangolin here, our last couple of days were primarily about giving Amber a chance to see some Lions, Leopards and Elephants up close and in style. And this we did. Nkorho is a very comfortable, albeit expensive camp. And though we didn’t see any rarities here, the animals are very habituated to vehicles. 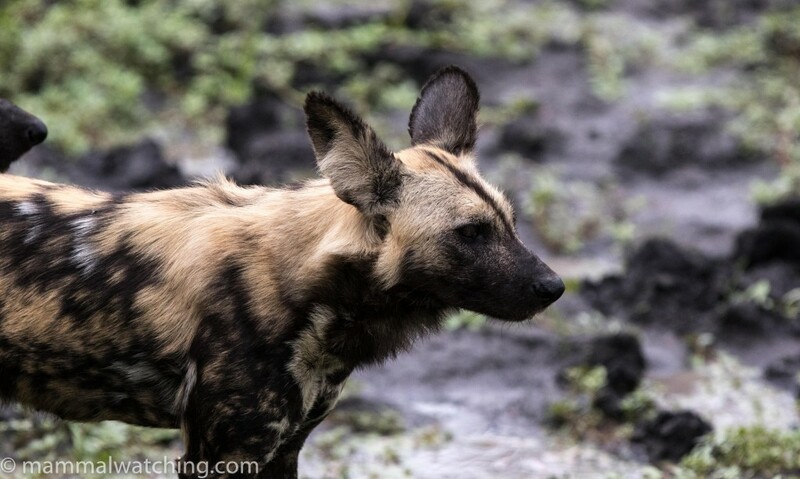 So much so I had the best Elephant and Leopard encounters of my life, as well as some great moments with Lions and Wild Dogs. Our guide, Pieter Dannhauser, and the tracker, David Mathebula, were extremely enthusiastic and great company too. Not only could they find the animals but they were expert in getting close to them. 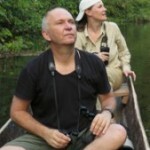 Sabi Sands comprises a number of different safari concessions. Many of them are in a sort of cooperative, whereby the vehicles share information over the radio and allow reciprocal access to their properties. So most of the reserve was at our disposal. We saw quite a long list of species here. 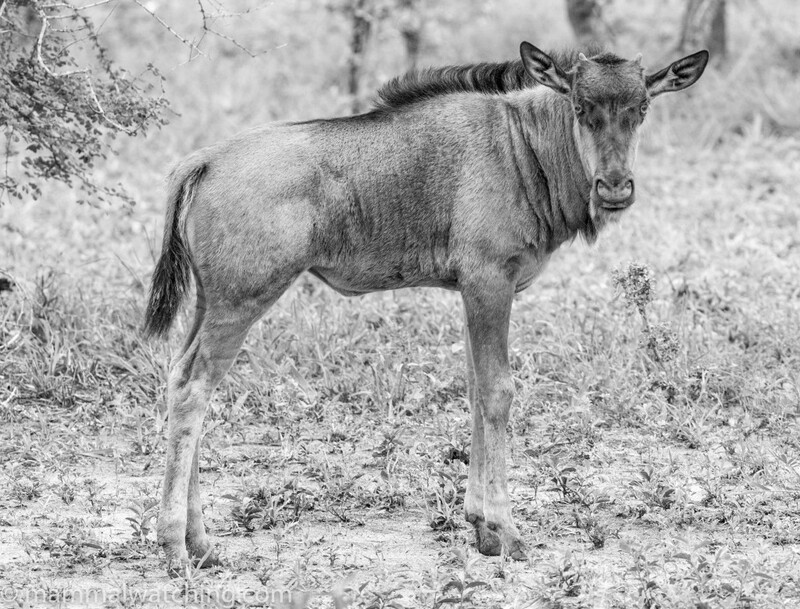 Elephants, Hippos, Nyalas, Kudu, Impala, Waterbuck, Zebra and Wildebeest were all common. 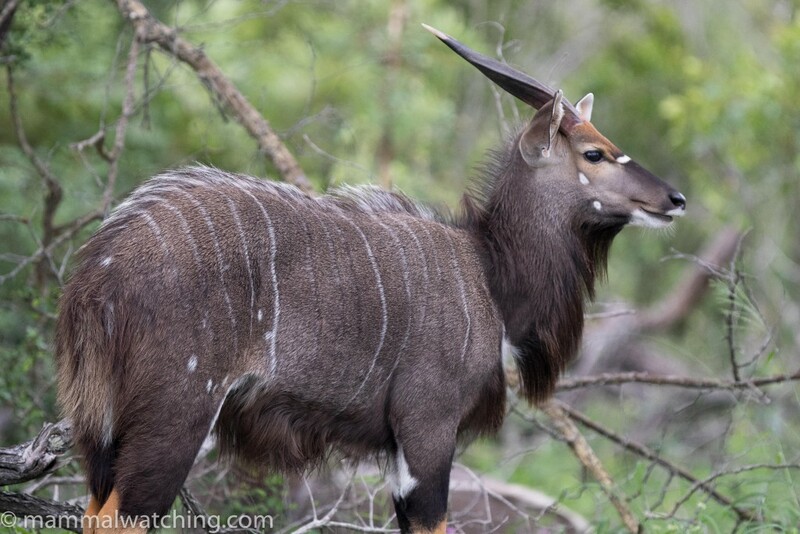 We saw a pair of White Rhinos, a pair of Bushbucks, a few Giraffes and just single one Warthog, Steenbok, Scrub Hare, Spotted Hyena and Bush (Grey) Duiker. 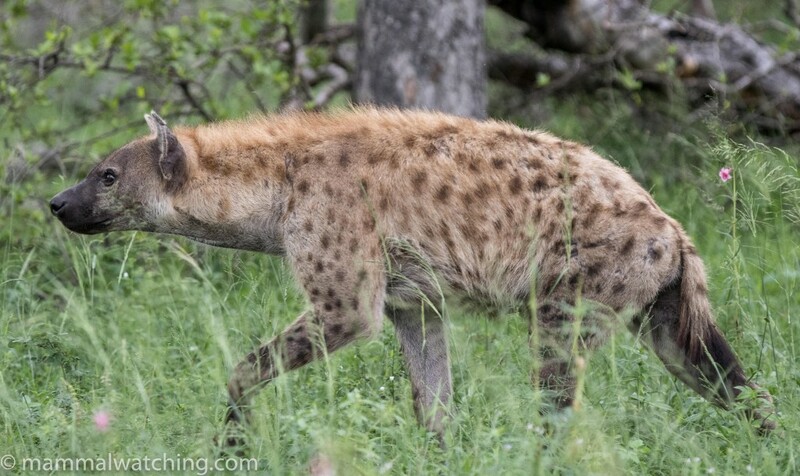 Our most unusual sighting was a Serval that sprang across the road. A species that Pieter hadn’t seen for six weeks. But nope… no Pangolin. We could have touched a pride of sleeping Lions on our first afternoon, and had a particularly exciting encounter with an Elephant on the same drive. 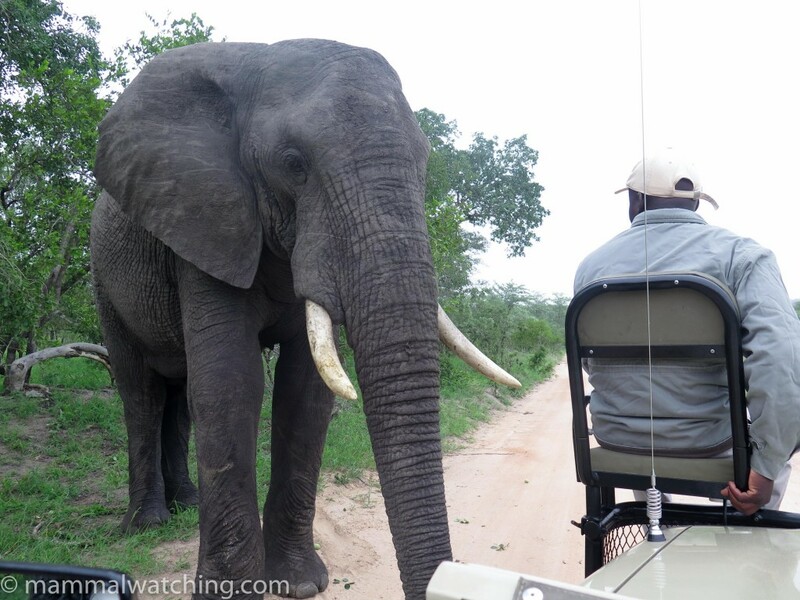 It shook the fruit out of a marula tree next to the road and immediately above our vehicle. I was more worried about fruit raining on my head than the Elephant and a bit of video from Amber is here. Later that afternoon we watched more Elephants playing in the lake. 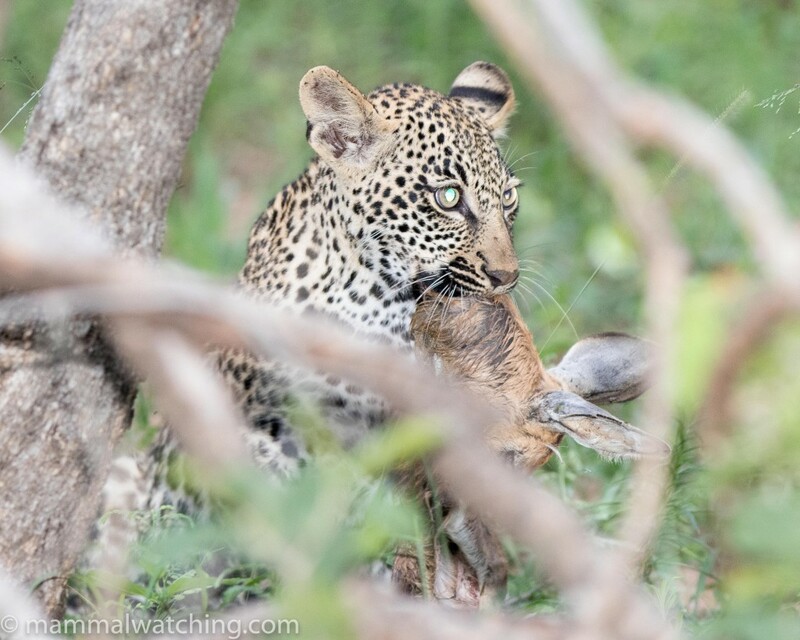 On our second evening, at sunset, we had a very special half an hour watching, up close, a juvenile Leopard interact with its mother after it finished the Steenbok it was munching on. This came immediately after watching a pack of Wild Dogs. There are a couple of bat boxes around the lodge. 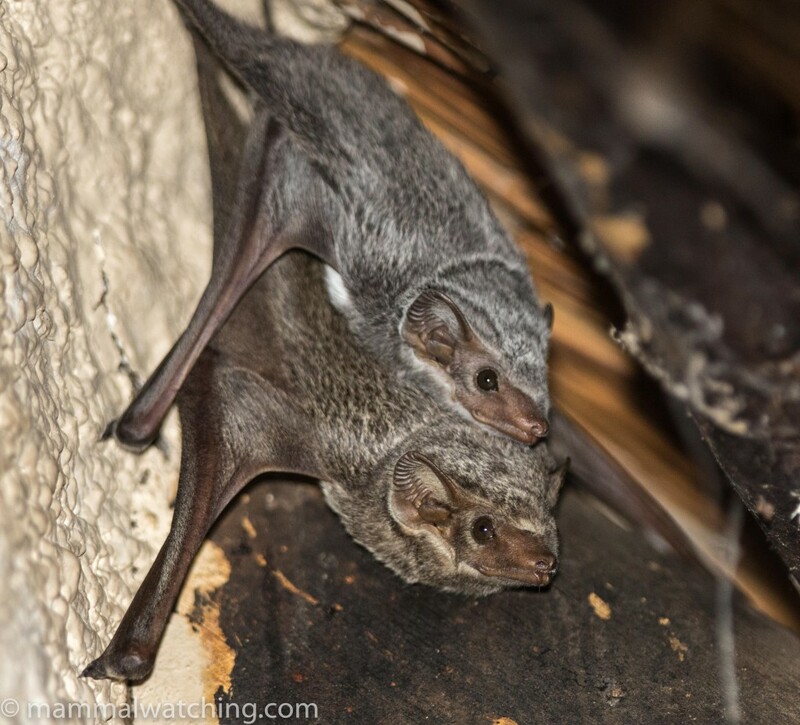 One contained a few more African Yellow House Bats, the other was home to a large lizard (which may have been full of bats!). Bush Squirrels were also common around camp. South Africa was every bit as good as I remember, maybe even better. I ended up with 13, perhaps 15 if I can ID my Wakkerstroom rodents, new species. This was three times what I was expecting. I also loved the food, the wine, the coffee (do not miss Truth in Cape Town), the people and the sunny scenery. A big thanks to all those who helped along the way, especially the Moolmans at Dunedin, and to Leon Marais for all his help when I was planning this. 51 SPECIES plus two rodents from Wakkerstroom that I have yet to identify. In reference to your comment about African Striped Weasels, I was camping in Chimanimani National Park in Zimbabwe in early 1999 and one of the people I met there had seen one in the cave where he was camped that morning. Good to see you got the dormouse at Dunedin – I stayed 3 nights and did not get that so have to go back – maybe next year! Lovely trip report Jon! I should seriously get to Dunedin for the Riverine Rabbit! The number two is very likely a Multimammate mouse, Mastomys sp (coucha/natalensis). 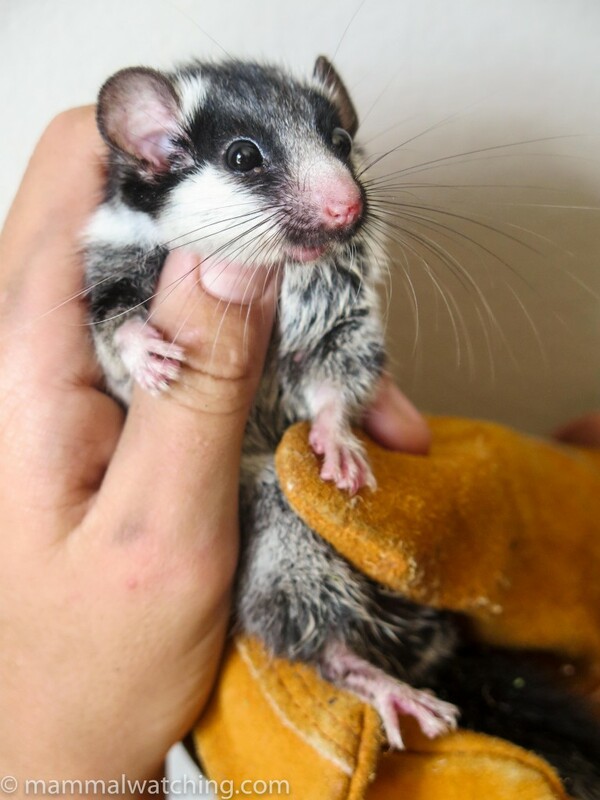 Ventral fur – dark with white tips. Tail is also very scaly. Not as fas as I can know. Some experts like to use the area where you trap as a broad guideline, but other than chromosomes, spermatozoa and I think I remember said some morphometrics….I trapped my first Malacothrix typica in December which led me to your site, lovely bat images!